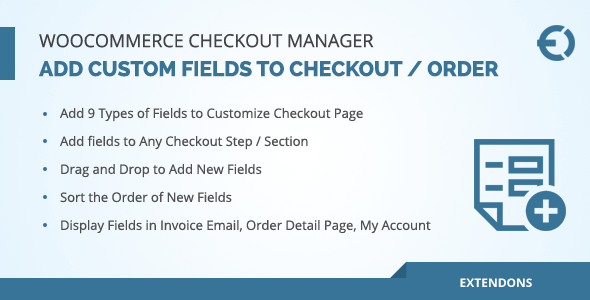 WooCommerce checkout manager plugin allows you to add 9 types of fields on the checkout page to extra information from customers during the checkout process. Supported fields are text field, text area, select box, multi-select box, checkbox, radio button, date picker, time picker, and password. You can add these fields in any checkout step such as billing, shipment, and additional section and these fields are also shown in email invoices. Users can see the additional details in my account section and admin can see in WooCommerce order view section. This plugin is very easy to use, you can drag and drop the new fields in the checkout page. You can also sort the order of new fields and customize the field labels.